Alaska Internet Marketing, Inc. (AIM) does not represent or endorse the accuracy or reliability of any of the information, content or advertisements (collectively, the "Materials") contained on, distributed through, or linked, downloaded or accessed from any of the services contained on this website or any website or directory operated by AIM (the "Service"), nor the quality of any products, information or other materials displayed, purchased, or obtained by you as a result of an advertisement or any other information or offer in or in connection with the Service (the "Products"). You hereby acknowledge that any reliance upon any Materials shall be at your sole risk. The Service and the Materials are provided by AIM on an "as is" basis, and AIM expressly disclaims any and all warranties, expressed or implied, including without limitation warranties of merchantability and fitness for a particular purpose, with respect to the service or any materials and products. In no event shall AIM be liable for any direct, indirect, incidental, punitive, or consequential damages of any kind whatsoever with respect to the Service, the Materials and the Products. 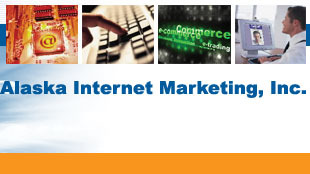 © 1996-2012 Alaska Internet Marketing, Inc. All rights reserved.